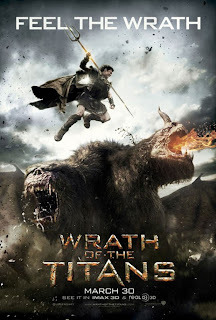 Ingredients: If you liked the characters of Clash of the Titans (2010), the action of Immortals, and the special effects of Lord of the Rings: The Two Towers, you will like this movie. Wrath of the Titans is a tremendous improvement over 2010’s remake of Clash of the Titans. The old cast is back but with new writers and directors, and it shows. Wrath of the Titans jumps right off from the end of the the previous movie with Perseus (as played by Sam Worthington) as a part-time fishermen and full-time son of Zeus in ancient Greece. Though Perseus has sworn to live his life as a mortal, Zeus (Liam Neeson) explains that since mankind has stopped praying to the Gods the long imprisoned Titans are breaking out. Perseus is forced to once again live up to his demi-god status and save the world; this time from greatest Titan of them all. Director Jonathan Liebesman, who also directed Battle Los Angeles and one of my personal favorites, Darkness Falls, definitely brought his A-game. Something that makes Wrath of the Titans far surpass its predecessor is that is knows when to sprinkle in a little levity to lighten the mood. Dark, depressing, and somber tones have a greater impact when you’ve just come off a chuckle. Toby Kebbell, who plays the role of light-hearted son of Poseidon, Agenor, was a perfect counterbalance to the brooding seriousness of Sam Worthington. While the previous Titan title was more geared towards the defiance of the Greek Gods and the trails of humanity, this one is more focused on redemption and hope. Hope is a good thing for action movies, people! Sometimes it’s good to end on a happy note. The writing has drastically improved and the characters get more time to develop beyond “Perseus is the hero, everyone fall in line.” Andromeda (Rosamund Pike) is finally shown taking a proactive role helping to rally the human forces against the Titan threat, where as in the Clash of the Titans remake Andromeda was pretty much standing around the whole time waiting to be sacrificed. Maybe it was the freedom of the script, as this is a brand-new tale on Greek mythology, but Liebesman has pumped up the action and visuals a lot more. There are several awe inspiring moments, such as when Perseus and crew must make their way through an ever changing stone labyrinth or when Cronos, father of the Gods and most powerful of the Titans, wipes out whole platoons of troops by splashing liquid hot magma about him. Terrific eye-candy, truly likable characters, I very much enjoyed it. It was definately better than the first one, but I still feel like Sam Worthington just doesn't have the right vibe for Perseus. One of the things is that Perseus was suppose to always out smart his opponents. Worthington just shows he can take a beating and keep on ticking, not my favorite interpretation of the character. Although I did love the labrynth. Yeah, Sam Worthington isn't my favorite actor. I have yet to see a part that he was really suited for. It doesn't surprise me you liked the labyrinth part. Did it happen to, oh I don't know, remind you of the Babe?